A pink-hued dish made super special with bitter, beautiful radicchio, and sweet Domaine Sante sweetener made from the sugars of wine grapes! Place a medium pot over a low simmer, and add 3 cups of vegetable stock. Place a ladle nearby, as we'll add the liquid to the rice throughout the cooking process. Dice the onion into a small 1/4" dice, and shred the radicchio. Cut the radicchio in half, then quarters. Remove the core, then thinly slice to make a nice shred. Reserve 1 cup of the shredded radicchio (you can use a combo of both types), for topping the risotto later. Add the chopped beets to a blender, and add the remaining 1/2 cup of stock to the beets, and blend until very smooth, about 20-30 seconds. Heat a large sauté pan over medium heat, and add the olive oil. Add in the onions, and cook about 5-7 minutes until translucent, stirring frequently so the onions don't burn on the edges. Add in the rice, coat with oil, and toast until the rice becomes fragrant, about 2-3 minutes. Add in the radicchio, and stir until it is slightly wilted, about 2 minutes. Season with the salt and pepper. De-glaze the pan by adding the wine while still stirring. Keep stirring until all the wine is absorbed into the rice. One half cup at a time, add the vegetable stock, and let the rice absorb most of it before the next addition. After you've added two cups of stock, check the rice for done-ness. It should be under al-dente, or under-done. Add the blended stock/beet mixture to the rice, and cook until the rice is perfectly done or al-dente, about 2-3 minutes longer. Remove from heat, and add the vegan butter. Stir until incorporated, then add the Bored-O ROUGE, stirring again. 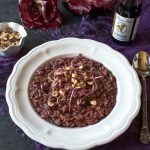 Portion finished risotto into four bowls, top with the remaining shredded radicchio, and hazelnuts. Serve with a glass of red wine and enjoy! If you can't find the Rosa di Veneto or Rosa di Pavoda, you can use a combination of regular Italian Radicchio found in most grocery stores, along with Belgian Endive.